Unless you're one of the lucky few with unlimited cell data, you're probably all too familiar with the data overage charges you can rack up just by living your normal Netflix-binging, Snapchat-loving life. But all it takes to stop the madness is disabling some semi-hidden settings and making a few behaviorial tweaks. Here's how to prevent those pesky fees from showing up on your next billing cycle. Our collective laziness loves not having to press play to watch whatever adorable puppy video shows up in our News Feeds, but that little feature is a huge data-eater. Simply turning it off can do a great deal to cut back on how much data you’re going through month to month. 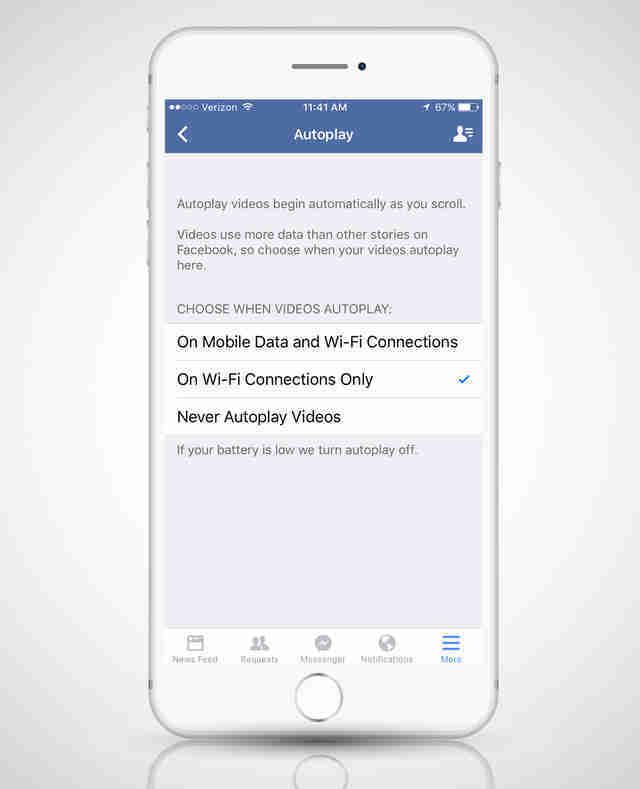 In your Facebook app, go to Settings > Videos and Photos > Autoplay > On Wi-Fi Connections Only. For Twitter, open the app, tap the Settings cog wheel > hit Video autoplay > select Use Wi-Fi only. There are some apps you absolutely want to be able to browse anytime, anywhere (lookin' at you, Facebook), but not every app on your phone needs access to your cellular data. Thankfully, you can individually toggle their access to data according to your preferences: head to Settings > Cellular and tick them on or off. In theory, Wi-Fi Assist is a legitimately useful feature if you’re constantly dealing with unreliable Wi-Fi networks. The thing is, if you’re not careful, it can also land you a $2,000 cellphone bill. 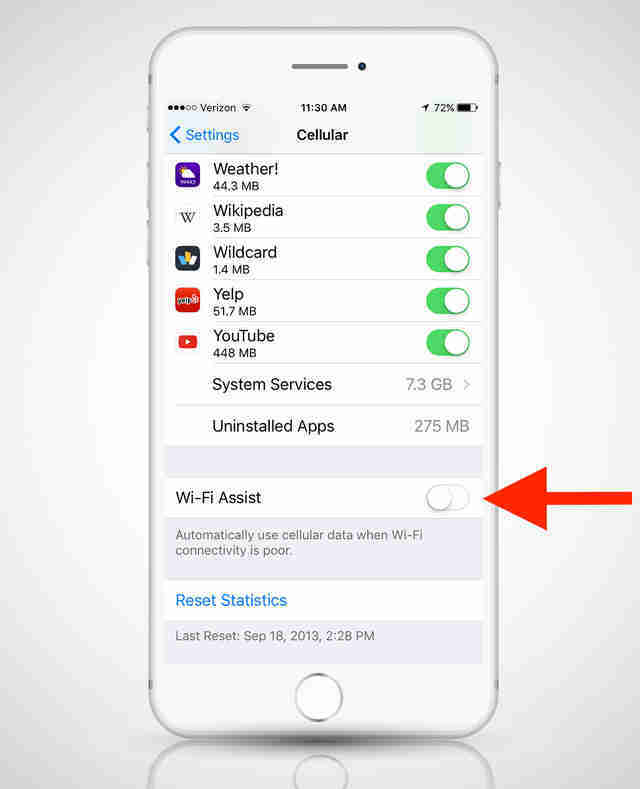 Rather than risk it, make sure it’s switched off: head to Settings > Cellular > Wi-Fi Assist. Some apps push out updates occasionally, others push them out all the damn time. If your phone is set up to automatically update apps on the regular, you’re needlessly eating through your data. To turn this off, go to Settings > iTunes & App Stores > disable Use Cellular Data. If you use your iCloud Drive account to work on various projects across multiple devices, you end up using a decent amount of data if you whip out your phone to make a change or share a document while Wi-Fi-less. 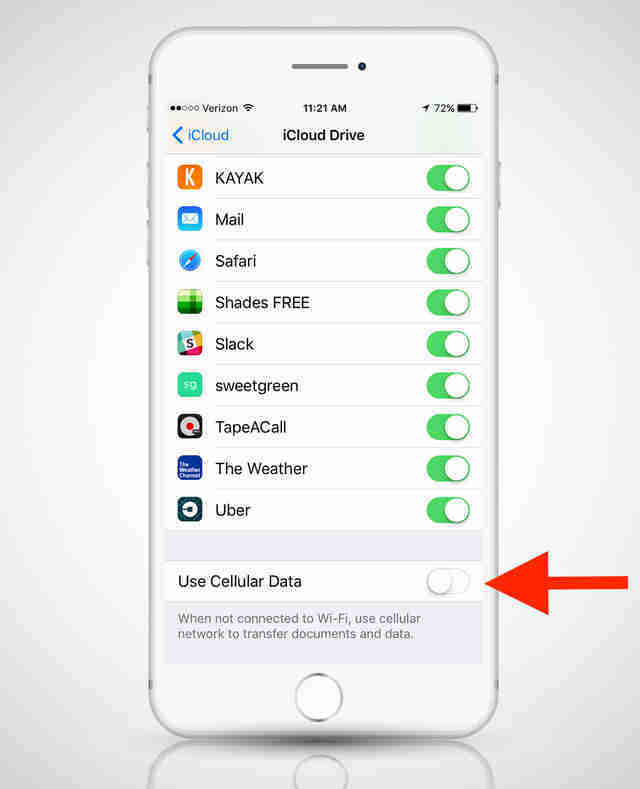 Avoid risking it and go to Settings > iCloud > iCloud Drive > disable Use Cellular Data. One of the biggest data hogs is one you never actually see: background app refreshing. It’s a feature baked into your iPhone that allows apps to refresh their content even when you're not actively using them. 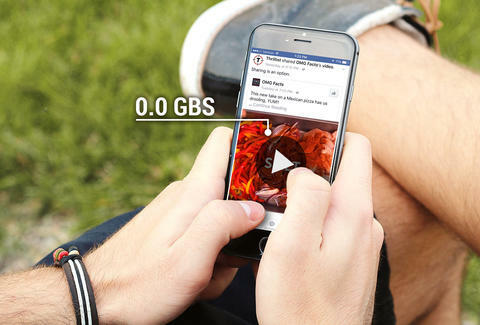 That means less lag and load time when you open them up, but also a whole bunch of unnecessary behind-the-scenes data usage when you aren’t on Wi-Fi. Turn that mess off -- head to Settings > General > Background App Refresh and disable it. 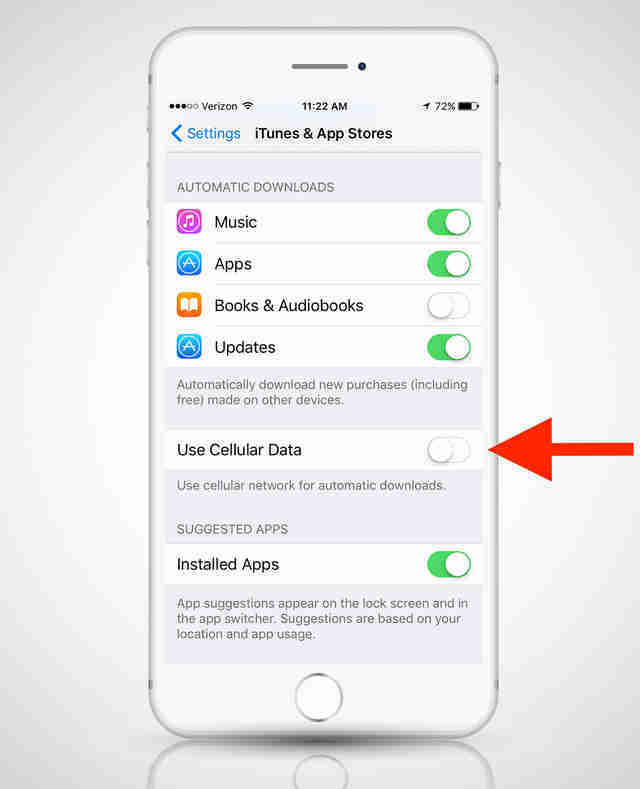 If you have cellular data turned on for your music service of choice (Spotify, Apple Music... Tidal? ), consider disabling its ability to download or even stream tracks when you're not connected to Wi-Fi. Open your Spotify app, tap the Settings cog wheel > Streaming Quality > disable Download Using Cellular. For Apple Music, open Settings > Music > disable Use Cellular Data. Unless you're set up with a decent international plan, it's a good move to disable data roaming altogether so you don't accidentally rack up some ungodly data fees while traveling abroad. Doing so won't affect how your phone works in your home country, but will prevent you from using the Internet sans Wi-Fi internationally. 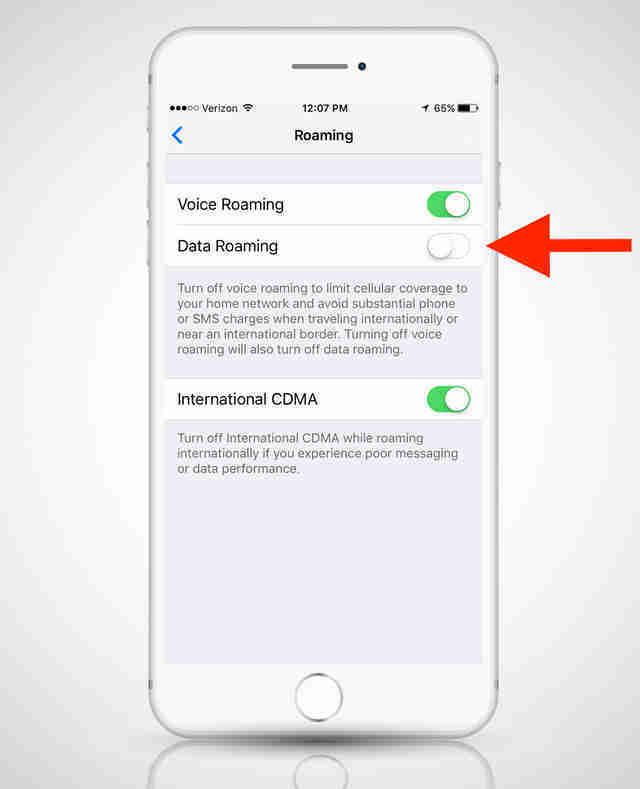 Go to Settings > Cellular > Roaming and tap the Data Roaming toggle button off. If you've already hit your data limit and can’t stand the thought of paying a dime more on overages, go cold turkey and cut your data off completely. Go to Settings > Cellular and disable Cellular Data. It means you won’t be able to Snapchat or browse Instagram if you leave your Wi-Fi zone, but you also won’t be on the hook for extra money and can focus on more fulfilling activities, like face-to-face conversation. Joe McGauley is a senior writer for Thrillist who’s pretty sure there are no data overage fees in heaven.